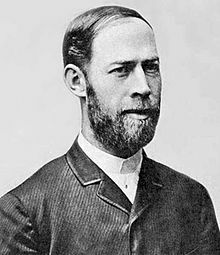 Heinrich Rudolf Hertz (22 February 1857 – 1 January 1894) was a German physicist. In 1888 he discovered the radio waves previously predicted by Maxwell's equations. He also proved that light is a kind of electromagnetic waves. The unit for frequency is named after him. Hertz was born in Hamburg in 1857. He studied engineering in Frankfurt and later at the University of Munich. He completed his Phd at the University of Berlin. He taught and continued research at the University of Bonn and University of Kiel. He died from blood poisoning in 1894. ↑ 1.0 1.1 1.2 1.3 1.4 Hertz, Heinrich Rudolf, In A Dictionary of Scientists. : Oxford University Press, 1999. http://www.oxfordreference.com/view/10.1093/acref/9780192800862.001.0001/acref-9780192800862-e-673, (subscription required), accessed 18 December 2015. This page was last changed on 17 March 2017, at 09:26.